For families with kids with autism, Christmas is a challenging time. Many children with autism have co-existing diagnoses, like sensory integration disorder. This is a neurological disorder that was first studied in-depth by A. Jean Ayres, Ph.D., OTR. Dr. Ayres describes sensory integration as the ability to organize sensory information for use by the brain. An individual with sensory integration dysfunction would therefore have an inability to organize sensory information as it comes in through the senses. To give you an example, many children with autism who can speak will tell you that fluorescent lights hurt their heads. They can actually hear the noise made by these lights and it causes pain within their bodies. One of Patrick’s responses to this disorder was that certain noises he would hear would make him dry heave and eventually throw up. We noticed this response with changing the plastic bag in the garbage can, lawnmowers, leaf blowers, etc. We were ill-prepared for his second Christmas morning (when he had just turned 12 months of age on December 17) when we had him try to open a Christmas present. Apparently the sound of the tearing paper had the same effect for him. I’m thinking this is NOT normal. Kids do not throw up opening their presents. I added that to the list of “weird things about Patrick” that I had begun gathering. 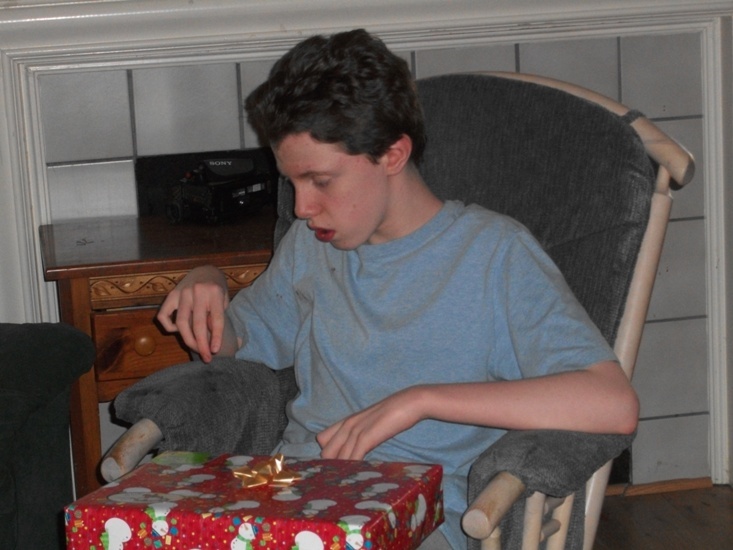 That Christmas it was more of a curiosity for me, as he had not yet been diagnosed with autism. The scientist in me wanted to see if I could correlate a direct relationship between the two items by running several trials to see if we could reproduce that at different times and settings. There indeed was a direct correlation. When the third Christmas came around, he was age 24 months. To see it happening again brought grief to my Christmas as we had gotten the autism diagnosis 6 months prior. By the fifth Christmas morning, my heart could no longer bear the pain Christmas morning brought. My husband and I decided that on Christmas Eve after Patrick was in bed, we would open our gifts to each other and that others gave us so when Christmas morning came, we would no longer associate it with a grieving heart. Three years ago, things suddenly changed for him. We were opening a gift on Christmas Eve and he looked curious about it all. We asked him if he wanted to open some presents with us. He gave us a huge smile and sad down with us. He would rip the paper and act like he was startled and would begin to laugh hysterically and clap his hands. He had recently begun to like the feeling of an adrenaline rush and loved being scared and startled. The tearing of the paper scared him, he experienced a rush of adrenaline, and he liked that. WHO CARED? My child was opening up a present and enjoying it. We allowed him to open up every single gift that evening, and then Christmas morning, he got to do it all over again (because we rewrapped everything). This year, the number of gifts under the tree is less, but that won’t stop us. We will be wrapping up old toys, put current clothes in boxes, just so we can experience the magic for which we yearned almost a decade. Christmas is about miracles, big and small. This time it was the simple act of opening up a gift about which others do not think twice. Find the joy of ripping off the paper of each one of your gifts this year, one tear at a time. What wonderful progress and what a great feeling for you. Lots of wonderful things have happened around Christmas with him. Thank you again for reading and commenting. I noticed many of the same responses with my son Matt. We started putting his presents in stockings and soft, felt, gift bags. He would open them in a different room and would neatly organize them on a table. He didn’t want to watch anyone open their gifts and preferred to keep his presents separate. Even as an adult, his presents are put into a large stocking and he is happy with that. We also realized early on that he could not handle the stimulation that came from being in a group or crowd. So our holidays were always spent at home. We did not travel or have extended family over. As he got older, we could add a friend or two, but never more than that. What an excellent idea. I never even thought about putting something in a stocking for him. Gift bags had the same effect (the crinkling noise). We were fortunate in that we adapted our Christmas to him so that we both could enjoy the holidays, but there are many families I speak with who are in difficult situations. They have to go visit both sides of the family; either side gets upset if they don’t visit and explaining to them why they cannot do this just causes arguments and hurt feelings. I feel the heart of this is that they aren’t understanding that with autism in their homes, they have to learn to adapt and change; they cannot expect the child to change overnight and bend to their customs and traditions. Some traditions have to be let go or modified; others can be introduced with time. 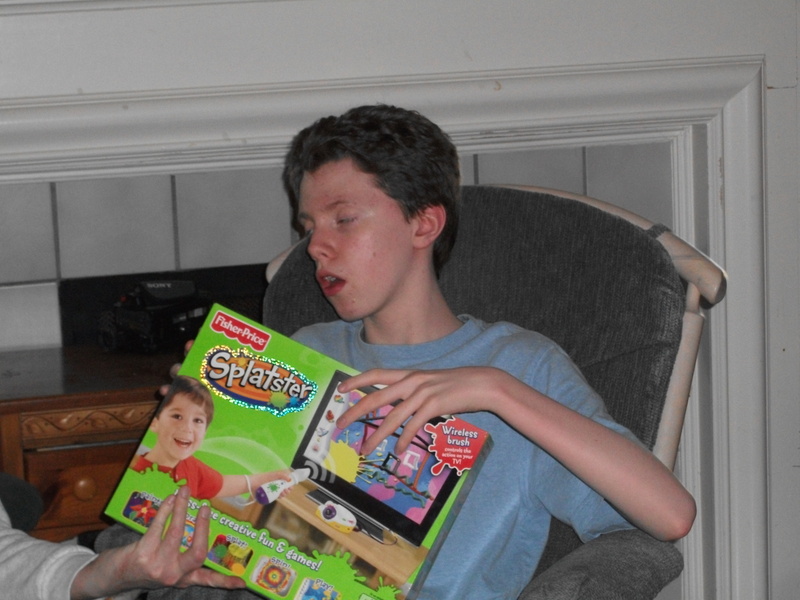 I enjoy reading about these stories you share about Patrick and will tweet again this morning to spread the joys of Christmas to those with autism. We all must remember that people of all types deserve the same rights and privileges as any one else. Awesome, Kenn. Thanks for your friendship and for helping spread the word.